This glamorous metal candelabra is the perfect feature to adorn any shelf or mantel. With nine platforms to hold candles and a sturdy base, this metal candelabra will add warmth and a gentle glow to any room in your home. The candelabra is constructed of layers of rows with varying heights to give unique dimension to the piece. This black matte item features a simple wrought iron silhouette and geometric, linear composition that can go anywhere. Candles are not included. Dimensions include: Overall: 21.5" W x 12" D x 9" H; Platform: 3" W. This one-of-a-kind item approximately weighs 3 pounds. Only quality materials and manufacturing will do. Product materials include: metal. Assembly: No assembly required. Made in China. d cor in your home or office and complement your d cor with a touch of exquisiteness. of your concerns while shopping, then our unrivaled design is guaranteed to impress you. - Lovely color and beautiful lines for a gorgeous touch. - Intricate crackled mosaic design that is painstakingly done. - Carefully made to ensure maximum durability. - Functional Candle Holder Set that gives you great value for money. - Unique craftsmanship that makes it the perfect gift. any d cor and impress you with unrivaled quality thanks to the superior craftsmanship. Click 'Add to Cart' now! - PREMIUM FEEL AND DESIGN: This 10.75 (H) x 3.5 (D) pillar candle holder is masterfully crafted to exude a premium feel and ensure total durability that rivals most table decorations centerpieces. 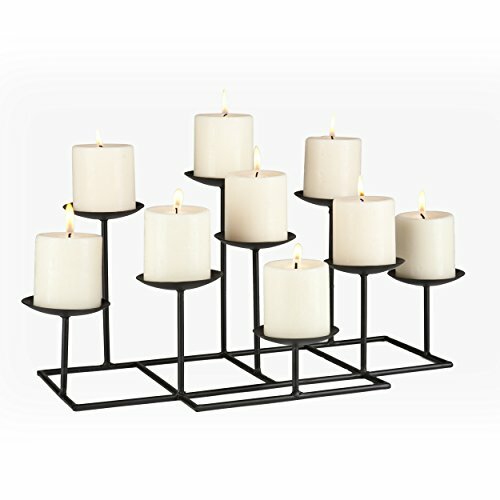 - WORKS LIKE A CHARM: With a perfectly sturdy base and stand designed to exclusively hold 3 x 3 pillar candles, you'll enjoy peace of mind as you use these decorative candle holders in your home. 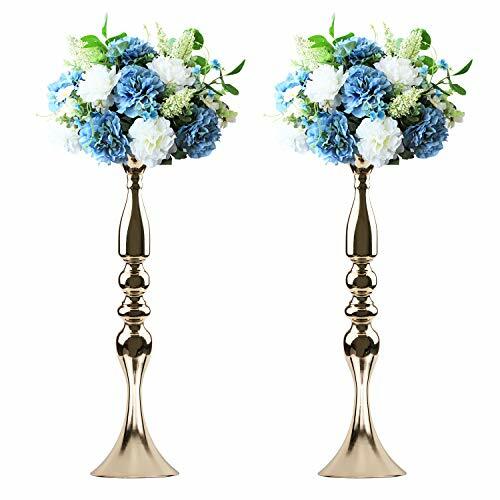 - GREAT FOR ANY OCCASION: Wedding, graduation, baby shower, bridal shower, quinceanera, thanksgiving, holiday or Christmas party, this candle holders pillar set functions as lovely dining table centerpieces d cor. - UNFORGETTABLE GIFT: If you're looking for that perfect wedding, anniversary, birthday, housewarming or Mother's Day gift, this stunning walnut candle holder set is guaranteed to spark a smile on anyone's face. Click 'Add to Cart' now! A brilliant, gorgeous, stylish, crystal and metal design candelabra / makeup brush stand. The gold color make your room extreme luxury,king temperament. It is the best choice of the table decorations in wedding, party, celebration, dinner table. It will be a perfect gift for your family, friends and lovers in this winter! Not only a candlestick holders, it also can be matched with flowers and use as a vase, make up brush storage or pencil holder, it will be a nice decorations and practical organizer on your room with your creativity and imagination. The entire candlestick frame is made of metal welded.Strong and sturdy! Made of high-quality crystal octagonal beads in series, crystal and clear, indulge you in a warm and elegant mood! The body of the holder treated with advanced electroplating technology, strong fixation, oxidation resistance. Why Choose Crystal Candle Holders? Crystal Candle Holders have always been a popular choice because of the sophisticated style and elegant look that they create in the home. At nighttime the artificial light from the bulbs will reflect in the crystal creating a soft comforting glow. The crystal candelabras look just as good in a modern setting and match seamlessly with surrounding D COR. Candlesticks holders are often used in conjunction with candles to decorate, and in addition to serving candles, it can be used as part of a home improvement. Exquisite candle holders can add to the fun of home life, spend a small amount of money, buy a variety of styles of novel candle sconces to decorate your room, use its wonderful shape and the beauty and aroma of candlelight, which prominent the taste of the owner. Or displayed on the shelf as a good collection,it is also an elegant embellishment of happy life! Widely Compatible: As a candle holders, we have a variety of styles and size for you to choose. Suitable for votive candle, tealight candle and more, perfect for flameless tealight candle, candle light, string lights in this Winter! Multiple Application: It is also a Cosmetic Makeup Brush Holder/Pen Holder for you, and it can be matched with flowers and use as a Vase, it will be a nice decorations and practical organizer for your table! 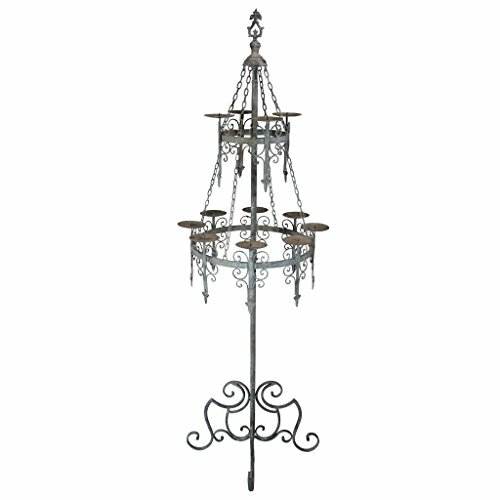 Metal Candle Holder--More Safety:This tealights candle holders are finished all-metal welded structure with crystal beads. No need to worry about the danger of candlestick being broken accidentally. 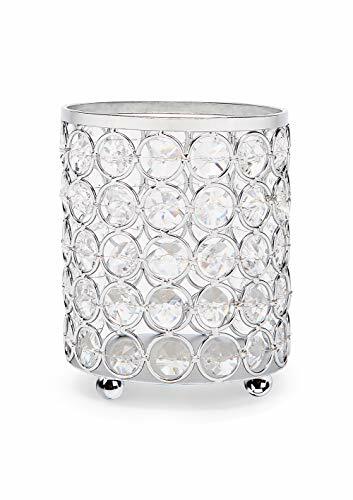 Crystal Candle Holders--Elegant Design:This cylinder candle holders are designed with crystal beads, great as dinner table decorative centerpieces in wedding and makeup brush organizer for girl, it will be a perfect gift in any specical holidays or birthday. At Manvi, we are committed to offer products that add beauty for your family life. Although we can't be around you, we hope to provide you with the most sincere service.Please feel free to contact us if you have any question about our candle holders! 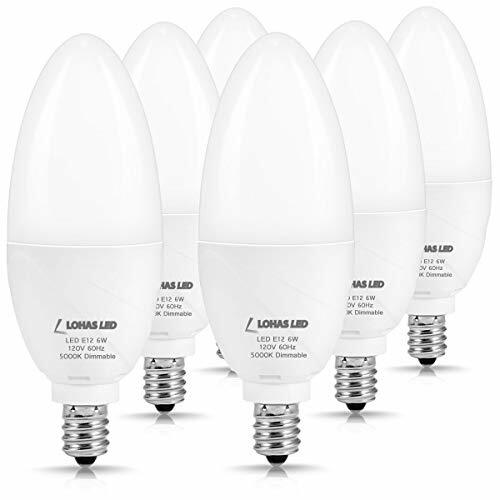 Dimmable LED Bulb--This E12 base candelabra bulb can be used to most of the dimmers, being able to adjust the brightness in your space anytime according to your special needs. This light is stable and pure, even at a very low brightness. High Performance--Replace 60w traditional bulb by 6w led, saving over 85% on electricity bill of lights. You'll need to change your light bulbs far less often. Natural and Real Daylight--with daylight white 5000k LED bulb is suitable for your ceiling fan, table lamps, wall lamps, coffee house, chandeliers light, hallway lighting, hotel rooms/lobbies, restaurants, offices etc. Fix to E12 base fixture-Designed to have the same shape and size as Edison bulbs with the standard E12 socket are perfectly fit most standard screw-in sockets, so you can replace your traditional bulbs easily. Safe&warranty--Do not contain mercury, UV or IR, CE, RoHS, FCC, which can create a cozy and healthy environment for your family. One year warranty, and if you have any questions, feel free to contact us. 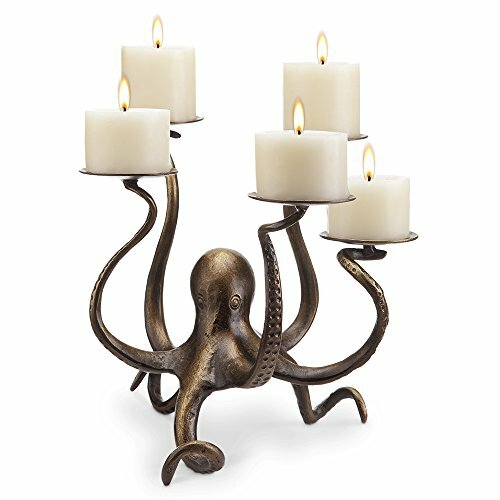 Holds five 3 inch candles with five arms while standing on the other three arms (candles not included) Crafted from aluminum, Dark Bronze Finish Dimensions: 15.5W x 12H, Weighs 3.4 pounds Adds an intriguing touch to your candle-lighting experience. Particularly useful to invoke a sense of mystery in a dark night. The creative construction is sure to cast the light of the candles in a wide area. Works as an interestingly themed decorative item for any enthusiast of the undersea. Kinda Cute, Kinda Eery Definitely Unique! 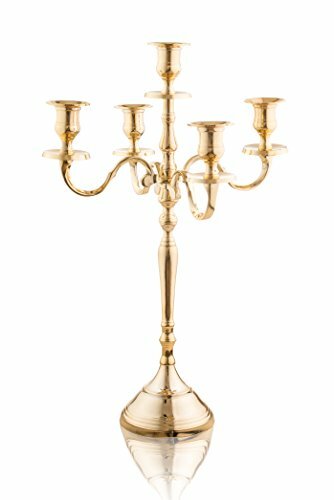 MALBARK CASTLE GOTHIC FLOOR CANDELABRA creates a sparklingly romantic evening with 12 filigree-flanked pedestals to hold your candles and set the scene for mystery and drama. A MEDIEVAL MASTERWORK that is over a foot tall, this marvel is as fitting in a castle of Teutonic knights as it is in your own. 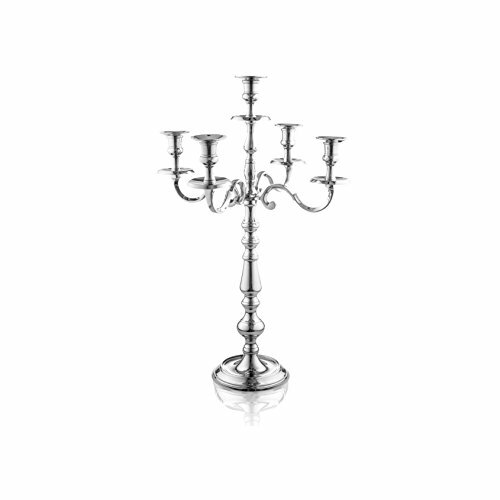 FORGED OF HIGH QUALITY METAL with a Gothic grey finish, this over 5-foot tall floor candelabra highlights a wide range of furniture decor. DESIGN TOSCANO EXCLUSIVE requires simple assembly and is ready for your candles (not included). Do not leave lit candles unattended. 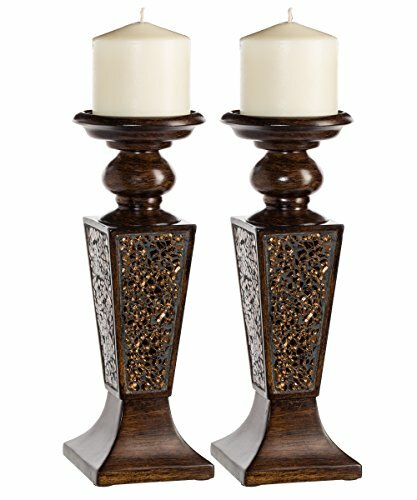 Our unique accent candle holder centerpiece measures 20.5Wx20.5Dx63.5H and weighs 13 lbs. EXQUISITE ELEGANCE: A dazzling design creates a work of art to enhance dining and buffet tables. This vintage candelabrum makes for a beautifully charming centerpiece. CLASSIC DESIGN: Add a touch of old time beauty to tabletops and dinner settings. A classic look lends this candle tree a timeless appeal that makes any setting and party look beautiful. STUNNING SILVER: Give your dinning decor an opulent appeal with our ornate silver candle holder. Nickel plated aluminum provides a durable finish and shine. 5-CANDLE BRANCHES: Let there be light and set a soothing mood with a candlelit dinner. The 5 arms fit all standard sized candles. Set at different heights, they create a symmetric visual appeal. INDOOR AND OUTDOOR: Put the finishing touches on dining tables with a piece of classic art. Design and decorate exquisite tables for indoor or outdoor parties or weddings. 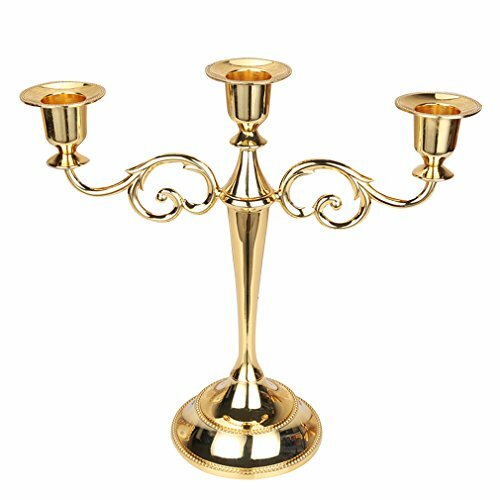 3 Arms Candle Holder,Enjoy our candelabra, it's sturdy but most of all elegant with beautiful detail. A top pick for wedding and party planners. This 3 Arms Candle Holder can hold three candles at the same time. Size: 26cm * 27cm / 10.23 * 10.63,can hold candle with the diameter of 1. 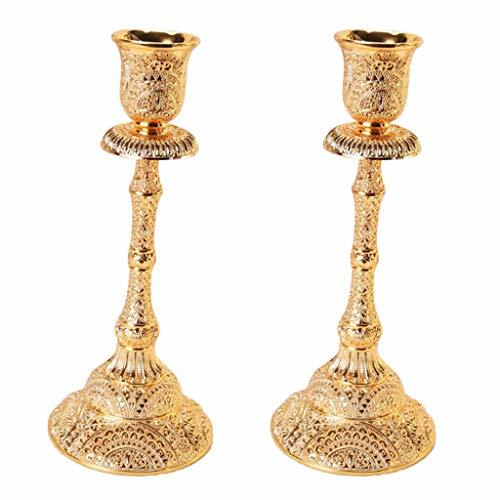 STUNNING GOLD: Give your dinning decor an opulent appeal with our ornate gold candle holder. Gold finished aluminum provides a durable finish and shine. 1.Effective Energy Savings: 6 Watts, 600 Lumens, 60 Watts Incandescent Equivalent. Voltage: 85V-265V 90% Energy Saving, Reduced Average Household Energy Costs to only $0.7 per Year! 2. 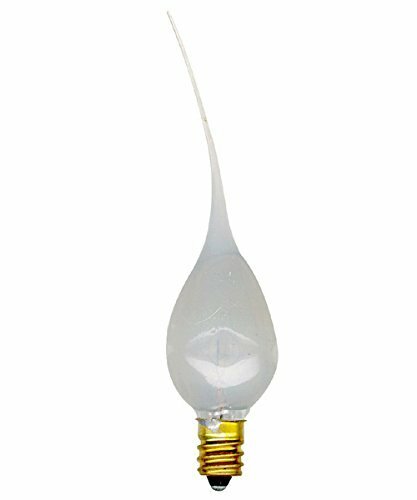 EXCELLENT PERFORMANCE: Non-dimmable candelabra bulb with life of 20,000 hours, last at least 18 years if used 3 hours per day. View angle over 280 degree, CRI>80, no mercury and UV/IR light, offering you soft lighting experience. 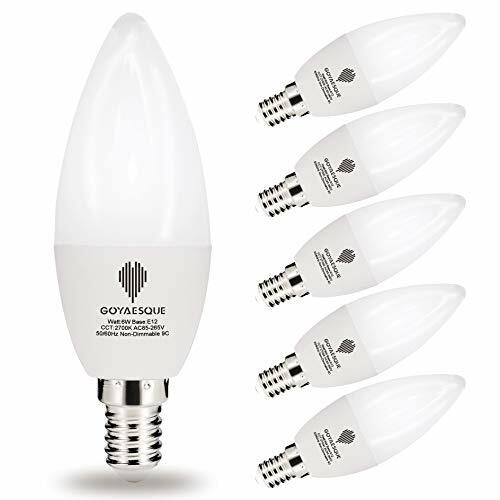 3.MULTIPLE USAGE: Ideal for use in kitchens, living room, bedrooms, hallways, table, floor lamps, chandelier, pendant fixtures or ceiling fixtures. 4.Uniformity color and high color rendering index. SDCM data is less than 2, it means the light color uniformity is very high and the people will not feel any discomfort for the light. The color rendering index also has an excellent performance in leve of Ra80, which takes us realistic color of all objects. 5.5.PLEASE CONTACT US BY E-MAIL IF YOU HAVE ANY PROBLEMS Youtime led bulbs can keep lighting about 30,000 hours and 24 months warranty. Reduce frequency of replacing light bulbs and buy with confidence. Whenever you have any questions, you can contact us . Once you use these light bulbs you'll never go back to conventional bulbs again. These bulbs have a dramatic country look and add down-home charm to electric candle creations, accent lamps or country style lighting applications. Steady-burning 7-1/2 watt clear bulbs are hand dipped in a translucent silicone coating that produces a flexible, tapering, flame-like appearance. Light travels throughout the coating to the very tip and imparts a charming appearance to the bulb. The bulbs have a candelabra base and are for indoor use only. Each bulb is individually boxed. You get a total of 10 bulbs in this offer. Value pack of 2, each size is about 19-1/2" tall x 5-1/8" bottom dia. x 4-7/8" top dia. Flower or candle not included. Solid and heavy plastic base insert for sturdy stand and hold. Made of metal with elegant gold finish to fit any decoration. Easy assembly required, instruction included and posted in the picture section. Great for birthdays, celebration ceremonies, parties and candlelight wedding or dinner. - European vintage style luxurious feel. - Metal alloy with surface plating structure makes it durable and stable. 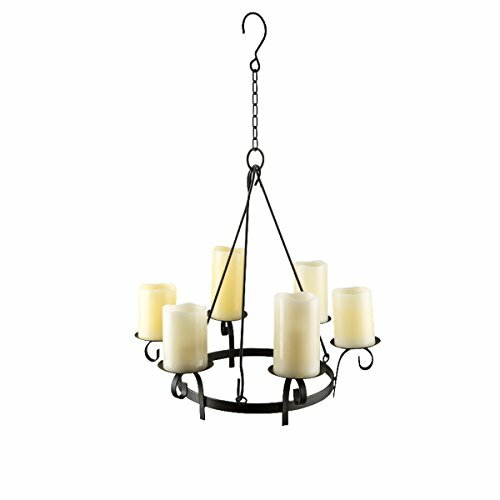 - Metal candelabra with 3 and 5 arms can hold three/ five candles at the same time. - Base dia. : 8cm / 3.15'', suitable for candle with diameter less than 0.98". - Easy to assemble and perfect for romantic wedding centerpiece and dinner home decoration. Please allow slight color difference due to the light. European vintage style luxurious feel. Metal alloy with surface plating structure makes it durable and stable. Metal candelabra with 3 and 5 arms can hold three/ five candles at the same time. Base dia. : 8cm / 3.15'', suitable for candle with diameter less than 0.98. Easy to assemble and perfect for romantic wedding centerpiece and dinner home decoration. 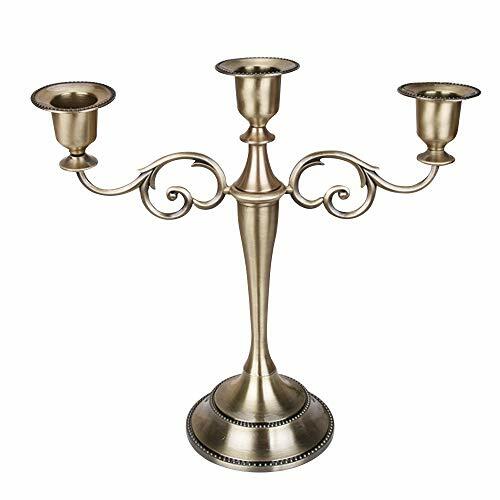 MATERIAL -Metal candelabra designed for 3 arm candelabra,10.6inch tall candle holder. DECORATION -The gorgeously vintage design adds the old time beauty on your tabletop and enhances your dining experience. APPLICATION -on the table with three candles to enjoy the candlelight dinner,or as home furnishings and wedding site decor. 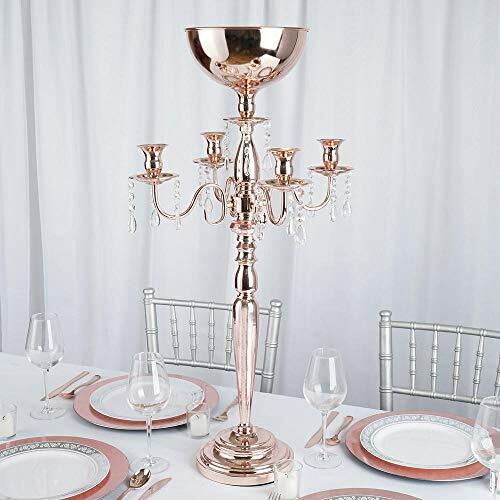 ADVANTAGES- This is the ideal candelabra to create an inspired atmosphere of welcoming warmth on your table.Delight your guests when you add lighted candles to make any occasion feel magical. PERFECT GIFT -As a beautiful and elegant artifact, it is suitable for various occasions, especially for wedding and candlelight dinner.European style, exotic and retro, can serve as an excellent present for family and friends.